← Select an event to view more information. Green links lead inside the guide, Brown links lead outside. Hover-view divs thanks to Genesis CSS. Hiii... I fixed the broken images because they were horrendous! Sorry I won't be updating TEC more than this. I'm semi-active again on Neo but sadly don't have the time to give to my sites. I'm taking a break from Neopets. I won't be updating The Expanded Calendar. I'm sorry to any of you who are disappointed by this news. If you would like to know my reasons you can find my post about it on my blog. And thank you, very much - my sites and the people who used them have given me a lot of happiness over the years. This month we have Valentine's Day, Anti Valentine's Day and the Shenkuu Lunar Festival too look forward to. There might also be some Daily Faerie Quests, but it's hard to predict when that might start. TNT stated in this week's editorial that The Neopies will not be taking place this year. They said they have 'a few other things planned instead'. The Snowager has now woken from its hibernation. The Snowager is *still* hibernating... Maybe it plans to sleep through January as well? Happy New Year! Welcome to 2015, Year 17 and January. This month we have The Neopies coming up at some point - presumably - and Sloth Appreciation Day and many pet days. The Snowager is still hibernating at time of writing but I expect it will wake up soon. Part of the New Features for the Day of Giving is up early, as TNT are on Christmas break until the 5th January. There will be more news on the 25th, including the announcement of the winners of the Dream Neopet Giveaway. The New Features for Ogrin Day has been published super early. The Dream Neopet Giveaway is now open to entrants, until the 19th. There will be 55 winners this year (instead of the usual 10) and 15 of those will be Vandagyres. The winners will be announced on the Day of Giving. You can find a free Raindorf Goodie Bag in the NC Mall, under the 'New' tab. The goodie bag only contains a Neocash item so you may claim it on side accounts as well. This year's Games Master Challenge has ended and you can receive your prizes. The trophy images are currently missing. The trophy images are all working now. The animation for the Advent Calendar is working today. Spot and click on the candycane to receive an extra prize. The Stocking Stufftacular is now available. You can purchase and hang stockings in preparation for the 8th, when the stockings will begin filling. I've done away with the entry for the Winter Starlight Celebration map and replaced it with the Snowager's own entry. This way everything on the map is covered in individual entries. So many month-long events in December! The Gift of Neocash, Advent Calendar (animation currently not working - try again later) have begun, the Winter Starlight Celebration map is available and the Snowager has begun it's winter hibernation, allowing you to steal treasure without risk of being blasted with snow and ice (this also means it is impossible to win the avatar during December). And don't forget the Games Master Challenge isn't quite over yet. If you haven't got your Monthly Freebies this month, today is your last chance. The News for Xweetok Day is up early because TNT are on Thanksgiving holiday for the rest of the week. The Games Master Challenge continues while they are gone. The Gift of Neocash will begin on the 28th November and end on the 4th January. Vandagyre Day will take place on the 12th November in future, but today's news is acting as a late celebration for them. If you follow the Neopets help sites then you probably knew this was coming, but... new Neopet! The Vandagyre makes the 55th pet and completes the alphabet of names. Plus find the free 'Vandagyre Goodie Bag' in the NC Mall. The Ruki has been made Limited Edition. Another new feature introduced in celebration: When your Neopet has a birthday, visit its petlookup to chose it a birthday gift. More 'quality of life' stuff again today: NPC shops will now clear out their stock regularly, so that they won't be always full of the items that don't sell. On the third day of birthday, Neo gave to us~ There are now new prizes to be won at Tombola, Anchor Management, Forgotten Shore and Lunar Temple. Also, the Trading Post and Auction House have new maximums: 2,000,000 NP and 50,000,000 NP respectively. In the NC Mall, certain Fortune Cookies opened from today onwards will have increased effects. More birthday celebrations! Today Neo has released five new site themes (one each for Kiko Lake, Roo Island, Gadgadsbogen, Tyrannia and Grey Day), all of which you can find in your Preferences right away. There are also three new avatars, though these are *not* already on your account. They can be earned by winning the Site Spotlight, Beauty Contest and the Lottery. There are also new Backgrounds available in the NC Mall, to match the site themes. These are on sale through November 16th, for the low price of 75NC each. We have begun the lead-up to Neopet's 15th Birthday. The first piece of celebration is an update to the Grave Danger Daily; it now includes some new items and is now accessible via the Neovia map. In the NC Mall there is a free birthday goodie bag ('Neopets 15th Birthday Celebration Goodie Bag') and if you're making a purchase of 1,000NC or more then you can use the Y16BIRTHDAY discount code to get 150NC off. In the latest Editorial, TNT confirmed that there will be a Games Master Challenge this year! The exact date it will begin is as yet unknown. Psst... Don't forget your Monthly Freebies for the new month. We have our trick or treat hunt! :D I was doubting whether this would happen but TNT promised it last year and they have delivered. There are five goodie bags to be found, one each in Tyrannia, Faerieland, Haunted Woods, Krawk Island and Terror Mountain. It looks like there is no Haunted Faire this year (nor the trick-or-treat hunt that was promised after TNT omitted it last year). There's a chance it could still happen (there are 10 days of October yet) but I think it's unlikely, especially considering the site is not entirely bug-free yet. My question is, when will things be back to 'normal'? Can we hope for the Games Master Challenge in November or is that out of the question too? What about Neo's birthday on Nov 15th? Neopets will be turning 15 years old, a number worthy of celebration. The Jetsam are available for creation in Create-a-Pet. So it turns out that 'two days of site downtime' was followed by one month of site bugginess. I gather some things still aren't working correctly. Petpages can now be updated but they are currently being subjected to the super-strict profanity filters that are usually only applied to neomails. In other news, Jetsam Day is coming up tomorrow (16th). They are usually released for creation in Create-a-Pet on their day. The Freebies For You page can be visited each month to receive 2,000 np and one food item per Neopet. This is available to main accounts only; side accounts are not permitted to collect this freebie. The Freebies resets at the beginning of the new month; therefore, you could receive your monthly freebies on Jan 31st and then again on Feb 1st. Half-Price Day takes place twelve times a year, on the 3rd of each month. For 24 hours the items in most Neopian shops are sold at half their usual price. There are a number of exceptions: User-owned shops, the Hidden Tower, Almost Abandoned Attic, General Store, Neohome Superstore, Igloo Garage Sale, Smuggler's Cove, Little Nippers, Neolodge and NC Mall are all excluded. On the third Wednesday of each month, users whose accounts are 60+ months (5+ years) old can buy items in the Hidden Tower at a 3% discount. Jellyneo has a Price Viewer that calculates the effect this discount has upon the items. As the Hidden Tower is a shop, buying from it is ordinarily restricted to main accounts only. However, The Neopets Team stated in Editorial 443 (2nd question down) that users may choose one of their accounts, be it main or side, with which to buy from the Hidden Tower on Discount Day. This allows users whose main accounts are younger than their side accounts to benefit. The required neopoints must still be supplied by the user's main account, however. Neopoints may be moved to a side account through the Trading Post. Game ratios are the ratios between in-game points and Neopoints. When you send your score in a game, your points are converted into Neopoints based on whatever ratio the game is set to at the time. As well as varying from game to the game the ratios also change each month - on the 25th. According to Editorial 334 (4th question down) the ratio changes are controlled by 'an automated system' to 'help balance out the flow of Neopoints into Neopia'. The Neopian Times holds special issues for several of Neopia's events. If enough pieces of work relating to an upcoming event are sent in and accepted, then the issue will have a theme (for example, Issue 577 was themed for Sloth Appreciation Day) and the writers and artists whose work is included in the issue will usually receive an item. The 50th issues are celebrated similarly, except that the item given out for 50th issues is new and exclusive, whereas for other special issues it is not. For a full listing of previous Special Issues and the items that have been given out, continue to Page Two. The following is an incomplete history of Special Issue item prizes. If you have any more information then I would love to hear from you, thanks. While most Special Issue prizes are pre-existing items, the 50th issues always award new, exclusive NT-themed items. *Issue 170 coincided with 2004's Day of Giving. The issue displayed the Day of Giving theme, but the item given out was an exclusive NT-themed prize, therefore it is listed both here and under the Day of Giving. The Ode to the Villains special was created by Just a Couple of Writers. April Fool's Day is not strictly a Special Issue at all. It wasn't considered an occasion within the Neopian Times until a group of writers and artists started devising annual pranks by submitting multiple pieces about an invented topic. The day has never been marked with its own theme and, as you can see below, has not been know to give out item prizes. **2004's Day of Giving coincided with Issue 170. The issue displayed the Day of Giving theme, but the item given out was an exclusive NT-themed prize, therefore it is listed both here and under the 50th Issues. Neopia observes daylight saving time (DST - the practice of temporarily advancing clocks during the summertime so that afternoons have more daylight and mornings have less). Since Neopets' headquarters are located in California, Neopian Standard Time (NST) follows the same daylight saving time as Pacific Standard Time (PST). Daylight saving time begins on the second Sunday of March. Clocks are turned forward an hour at 02:00 am NST. Daylight saving time ends on the first Sunday of November. Clocks are turned backward an hour at 02:00 am NST. The Festival of Neggs is a small-scale event hosted by Kari the Negg Faerie. Neggs are hidden in a different area of Neopia each day and Kari gives out clues that guide the player in finding them. New and old items can be won by finding all of the Neggs. The 'Festival of Neggs' site theme can be obtained by successfully finding each patterned Negg on the day of its release. The Festival also includes an optional Neocash activity. In Y14 (2012) the Festival also included The Mysterious Negg logic puzzle, which afterwards spawned the Mysterious Negg Cave daily. The date of the Festival is variable because it is timed to coincide with Easter, which itself can take place any time between March 22nd and April 25th. In Y17 (2015), Easter will take place on April 5th. The Festival of Neggs is likely to begin a week or so before this date. 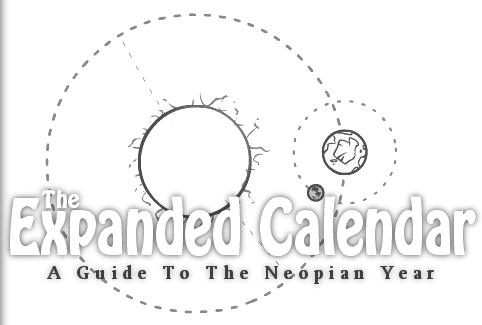 The Neopian Times holds a Special Issue in celebration of this festival. The Neopies is a small-scale event modelled on annual awards ceremonies. Each day players can vote for their favourite nominee in various categories (such as Best New Paint Brush or Best New Game) to collectively decide the highs and lows of the previous year. Voting earns the player items and Neopoints. A new, exclusive item is given out to those who voted every day. TNT stated in Editorial 677 that The Neopies will not be taking place this year. They said they have 'a few other things planned instead'. Aisha Day is celebrated with a New Features post introducing two new colour options, new Aisha-related items and dedicated Poetry and Art galleries. Plus, the Aisha can receive free training today at The Swashbuckling Academy (under level 40 only). Gnorbu Day is celebrated with a New Features post introducing two new colour options, new Gnorbu-related items and dedicated Poetry and Art galleries. Plus, the Gnorbu can receive free training today at The Swashbuckling Academy (under level 40 only). Additionally, the text on all Gnorbu petlookups is temporarily changed from '[petname] the [colour] Gnorbu' to '[petname] the [colour] ShearedGnorbu'. This dates from the first Gnorbu Day in Y9 (2007) when the petlookup images were replaced with images of a hairless, sheared Gnorbu. The full shearing has not happened since the introduction of Customisation. Buzz Day is celebrated with a New Features post introducing two new colour options, new Buzz-related items and dedicated Poetry and Art galleries. Plus, the Buzz can receive free training today at The Swashbuckling Academy (under level 40 only). Dr. Frank Sloth demands appreciation on this day. His Horribleness is celebrated in a New Features post of Sloth-related items and dedicated Poetry and Art galleries. In the past Dr. Sloth has taken control of the New Features on his day to ensure full obedience. This has happened in Y6, Y9, Y10 and Y12. The 'I *heart* Sloth' avatar can be obtained today by completing the test at the Mind Control Laboratory. The Neopian Times holds a Special Issue in celebration of this day. Dr. Sloth has also been known to take over the news on Mutant Day. Elephante Day is celebrated with a New Features post introducing two new colour options, new Elephante-related items and dedicated Poetry and Art galleries. Plus, the Elephante can receive free training today at The Swashbuckling Academy (under level 40 only). Kacheek Day is celebrated with a New Features post introducing two new colour options, new Kacheek-related items and dedicated Poetry and Art galleries. Plus, the Kacheek can receive free training today at The Swashbuckling Academy (under level 40 only). Shenkuu Lunar Festival is celebrated with a New Features post introducing new related items. The date of the festival usually coincides with the Chinese New Year, which can fall any time between 21st January and 21st February, as in the table below. The Faeries offer daily quests for the span of about three weeks. The Quests page can be visited each day for both an item prize and a quest at random from the Air, Dark, Earth, Fire, Light, Water, Battle, Fountain, Queen, Space or Crafting Faerie. An additional item prize is given out to those who visit every day (completing every quest is not required). Zafara Day is celebrated with a New Features post introducing two new colour options, new Zafara-related items and dedicated Poetry and Art galleries. Plus, the Zafara can receive free training today at The Swashbuckling Academy (under level 40 only). Jhudora Day is celebrated with a New Features post introducing new Jhudora-related items and dedicated Poetry and Art galleries. Plus, the text on Neopets' frontpage is coloured purple for the day and, due to Jhudora's rivalry with Illusen, it is mysteriously impossible to take an Illusen quest today. The 'Evil Jhudora' avatar can be obtained today by completing any one of Jhudora's quests. Lenny Day is celebrated with a New Features post introducing two new colour options, new Lenny-related items and dedicated Poetry and Art galleries. Plus, the Lenny can receive free training today at The Swashbuckling Academy (under level 40 only). Valentine's Day is celebrated with a New Features post introducing new Valentine-related items and dedicated Poetry and Art galleries. The NC Mall usually releases a free Goodie Bag containing a Valentiney item (see Jellyneo's IDB for a list). In Y15 (2013) there was also a week-long Neocash event. The 'Valentine's Day' site theme is automatically seen by everyone on this day. It can be permanently obtained however by gifting or receiving the item 'A Mysterious Valentines Card' (today only). When gifted the item becomes 'used up' and disappears and both the gifter and the recipient obtain the site theme. The 'Valentine Chia' avatar can be obtained today by sending the Pubbyblew And Rose NeoGreeting to someone. Anti Valentine's Day is celebrated with a New Features post introducing new Anti Valentines-related items and dedicated Poetry and Art galleries. Chia Day is celebrated with a New Features post introducing two new colour options, new Chia-related items and dedicated Poetry and Art galleries. Plus, the Chia can receive free training today at The Swashbuckling Academy (under level 40 only). Tonu Day is celebrated with a New Features post introducing two new colour options, new Tonu-related items and dedicated Poetry and Art galleries. Plus, the Tonu can receive free training today at The Swashbuckling Academy (under level 40 only). As a Limited Edition pet, the Tonu is not permanently available for creation at the Create-A-Pet page. LE pets are typically released for creation - in large but limited numbers - on their pet days. The following is a record of the Tonu Day releases only. The Draik and Krawk are Restricted and the Chomby, Lutari, Cybunny, Hissi, Koi, Kiko, Ruki, Poogle and Jetsam are Limited Edition. Mynci Day is celebrated with a New Features post introducing two new colour options, new Mynci-related items and dedicated Poetry and Art galleries. Plus, the Mynci can receive free training today at The Swashbuckling Academy (under level 40 only). The Daily Dare is a month-long gaming event in which players are challenged to beat particular scores on a different game each day. The event is hosted by AAA, Abigail and Lulu, where AAA's scores are 'Hard', Abigail's are 'Easy' and Lulu runs an optional Neocash element. Completing each day's challenges earns the player both new and old items. At the end of the event the player may receive the 'Daily Dare' site theme, additional items, neopoints and a trophy (prizes vary depending on how much was completed). In Y15 (2013) the event also featured a new character, Chadley. The 'Daily Dare: Chadley' site theme was included in that year's final prizes. AAA 'took a break' in Y16 and the Daily Dare was skipped. It remains to be seen whether it will make a reappearance in Y17. *Y15's DD was postponed due to the War of the Obelisk and did not take place until after both the war and the Altador Cup had ended. AAA also appears in the Games Master Challenge. The Gadgadsbogen festivities are a celebration of Mystery Island's ever-changing flora. Every year a number of items stocking at the Tropical Food Shop are retired and replaced with newly-discovered fruits and berries. The day is marked with a New Features post introducing the new items and dedicated Poetry and Art galleries. The date of the New Features post varies in keeping with the unpredictability of nature. The 'Gadgadsbogen!' avatar can be obtained on March 4th by viewing the Neopedia entry Trickster Llugh and the Legend of Gadgadsbogen. Uni Day is celebrated with a New Features post introducing two new colour options, new Uni-related items and dedicated Poetry and Art galleries. Plus, the Uni can receive free training today at The Swashbuckling Academy (under level 40 only). The first time March 3rd was cancelled was in Y6 (2004), when The Neopets Team explained in New Features that they were updating the syncing time of daily content and that the 3rd would essentially be skipped over because of the change. Since then, March 3rd has continued to be cancelled 'due to lack of interest' as a joke. Nothing that should also happen on March 3rd (such as Half-Price Day or your birthday) is in any way affected by this. Gelert Day is celebrated with a New Features post introducing two new colour options, new Gelert-related items and dedicated Poetry and Art galleries. Plus, the Gelert can receive free training today at The Swashbuckling Academy (under level 40 only). Scorchio Day is celebrated with a New Features post introducing two new colour options, new Scorchio-related items and dedicated Poetry and Art galleries. Plus, the Scorchio can receive free training today at The Swashbuckling Academy (under level 40 only). Illusen Day is celebrated with a New Features post introducing new Illusen-related items and dedicated Poetry and Art galleries. Plus, the text on Neopets' frontpage is coloured green for the day and, due to Illusen's rivalry with Jhudora, it is mysteriously impossible to take a Jhudora quest today. Illusen Day also happens to coincide with St. Patrick's Day, which is marked in a small way at the Pick Your Own game, where for today only players have a chance of finding the items '3 Leaf Clover', '4 Leaf Clover' and '12 Leaf Clover'. The 'Illusen Doll' avatar can be obtained today by completing any one of Illusen's quests. Chomby Day is celebrated with a New Features post introducing two new colour options, new Chomby-related items and dedicated Poetry and Art galleries. Plus, the Chomby can receive free training today at The Swashbuckling Academy (under level 40 only). As a Limited Edition pet, the Chomby is not permanently available for creation at the Create-A-Pet page. LE pets are typically released for creation - in large but limited numbers - on their pet days. The Draik and Krawk are Restricted and the Tonu, Lutari, Cybunny, Hissi, Koi, Kiko, Ruki, Poogle and Jetsam are Limited Edition. The Neopets Team can be relied upon to attempt to prank players for April Fool's Day. Past pranks have varied widely, from pets becoming diseased and infectious (Y13) to a new feature called Neocharge that charged neopoints for every pageview (Y8). The 'Quiguki April Fools Avatar' can be obtained on April 4th by visiting the New Features. Writers and artists of The Neopian Times independently orchestrate their own prank by submitting multiple works to the NT that all feature an invented subject. Past pranks have included the introduction of Neoquest III (Y14) and the discovery of a new world called Goldrun (Y11). Shoyru Day is celebrated with a New Features post introducing two new colour options, new Shoyru-related items and dedicated Poetry and Art galleries. Plus, the Shoyru can receive free training today at The Swashbuckling Academy (under level 40 only). The 'Quiguki April Fools Avatar' can be obtained today by visiting the New Features. The 'Easter Cybunny' avatar can be obtained on the 8th, 9th or 10th of April by sending the Easter NeoGreeting to someone. Lawyerbot Appreciation Day is celebrated with a New Features post introducing new Lawyerbot-related items and dedicated Poetry and Art galleries. Grey Day is celebrated with a New Features post introducing new Grey-related items and dedicated Poetry and Art galleries. It also often releases the Grey colour for either one or two species of Neopet. Krawk Day is celebrated with a New Features post introducing two new colour options, new Krawk-related items and dedicated Poetry and Art galleries. Plus, the Krawk can receive free training today at The Swashbuckling Academy (under level 40 only). The Krawk is the only pet that has never been available in the Create-A-Pet page. Krawks must be created by other methods, such as taking the Krawk petpet to the Fungus Caves or using Morphing or Transmogrification potions. They are not released for creation on their pet day. The Draik is Restricted and the Tonu, Chomby, Lutari, Cybunny, Hissi, Koi, Kiko, Ruki, Poogle and Jetsam are Limited Edition. Lutari Day is celebrated with a New Features post introducing two new colour options, new Lutari-related items and dedicated Poetry and Art galleries. Plus, the Lutari can receive free training today at The Swashbuckling Academy (under level 40 only). As a Limited Edition pet, the Lutari is not permanently available for creation at the Create-A-Pet page. LE pets are typically released for creation - in large but limited numbers - on their pet days. The Draik and Krawk are Restricted and the Tonu, Chomby, Cybunny, Hissi, Koi, Kiko, Ruki, Poogle and Jetsam are Limited Edition. Kougra Day is celebrated with a New Features post introducing two new colour options, new Kougra-related items and dedicated Poetry and Art galleries. Plus, the Kougra can receive free training today at The Swashbuckling Academy (under level 40 only). Cybunny Day is celebrated with a New Features post introducing two new colour options, new Cybunny-related items and dedicated Poetry and Art galleries. Plus, the Cybunny can receive free training today at The Swashbuckling Academy (under level 40 only). As a Limited Edition pet, the Cybunny is not permanently available for creation at the Create-A-Pet page. LE pets are typically released for creation - in large but limited numbers - on their pet days. The Draik and Krawk are Restricted and the Tonu, Chomby, Lutari, Hissi, Koi, Kiko, Ruki, Poogle and Jetsam are Limited Edition. Lupe Day is celebrated with a New Features post introducing two new colour options, new Lupe-related items and dedicated Poetry and Art galleries. Plus, the Lupe can receive free training today at The Swashbuckling Academy (under level 40 only). Hissi Day is celebrated with a New Features post introducing two new colour options, new Hissi-related items and dedicated Poetry and Art galleries. Plus, the Hissi can receive free training today at The Swashbuckling Academy (under level 40 only). As a Limited Edition pet, the Hissi is not permanently available for creation at the Create-A-Pet page. LE pets are typically released for creation - in large but limited numbers - on their pet days. The Draik and Krawk are Restricted and the Tonu, Chomby, Lutari, Cybunny, Koi, Kiko, Ruki, Poogle and Jetsam are Limited Edition. Tyrannian Victory Day is celebrated with a New Features post introducing new Tyrannia-related items and dedicated Poetry and Art galleries. It also often releases the Tyrannian colour for either one or two species of Neopet. Moehog Day is celebrated with a New Features post introducing two new colour options, new Moehog-related items and dedicated Poetry and Art galleries. Plus, the Moehog can receive free training today at The Swashbuckling Academy (under level 40 only). Koi Day is celebrated with a New Features post introducing two new colour options, new Koi-related items and dedicated Poetry and Art galleries. Plus, the Koi can receive free training today at The Swashbuckling Academy (under level 40 only). As a Limited Edition pet, the Koi is not permanently available for creation at the Create-A-Pet page. LE pets are typically released for creation - in large but limited numbers - on their pet days. The Draik and Krawk are Restricted and the Tonu, Chomby, Lutari, Cybunny, Hissi, Kiko, Ruki, Poogle and Jetsam are Limited Edition. Yurble Day is celebrated with a New Features post introducing two new colour options, new Yurble-related items and dedicated Poetry and Art galleries. Plus, the Yurble can receive free training today at The Swashbuckling Academy (under level 40 only). The Altador Cup is a large-scale event in the form of a sporting tournament in which teams from the lands of Neopia travel to Altador to compete in the game of Yooyuball. Users can participate by choosing a team and playing Yooyuball and/or side games to earn points that affect their team's progress in the Cup. An individual's points also act as currency for the prize shop at the end of the tournament. Users are also awarded with a trophy and the 'Altador Cup' site theme, plus at least one avatar (see Avatars below). The event also includes a small Staff Tournament (between members of The Neopets Team) and an optional Neocash-related feature. The 'Altador Cup' avatar can be obtained by participating in the Altador Cup. The 'Altador Cup Player' avatar can be obtained by achieving Rank One. The 'Altador Cup Staff Tournament' avatar can be obtained by participating in the Staff Tournament. Fyora Day is celebrated with a New Features post introducing new Fyora-related items and dedicated Poetry and Art galleries. It also often releases the Faerie colour for one species of Neopet. JubJub Day is celebrated with a New Features post introducing two new colour options, new JubJub-related items and dedicated Poetry and Art galleries. Plus, the JubJub can receive free training today at The Swashbuckling Academy (under level 40 only). Petpet Appreciation Day (initiated by the Petpet Protection League) is celebrated with a New Features post introducing new Petpet-related items, dedicated Poetry and Art galleries, new Petpet colours and sometimes an entirely new Petpet species. Quiggle Day is celebrated with a New Features post introducing two new colour options, new Quiggle-related items and dedicated Poetry and Art galleries. Plus, the Quiggle can receive free training today at The Swashbuckling Academy (under level 40 only). Nimmo Day is celebrated with a New Features post introducing two new colour options, new Nimmo-related items and dedicated Poetry and Art galleries. Plus, the Nimmo can receive free training today at The Swashbuckling Academy (under level 40 only). Kau Day is celebrated with a New Features post introducing two new colour options, new Kau-related items and dedicated Poetry and Art galleries. Plus, the Kau can receive free training today at The Swashbuckling Academy (under level 40 only). Acara Day is celebrated with a New Features post introducing two new colour options, new Acara-related items and dedicated Poetry and Art galleries. Plus, the Acara can receive free training today at The Swashbuckling Academy (under level 40 only). Flotsam Day is celebrated with a New Features post introducing two new colour options, new Flotsam-related items and dedicated Poetry and Art galleries. Plus, the Flotsam can receive free training today at The Swashbuckling Academy (under level 40 only). Ixi Day is celebrated with a New Features post introducing two new colour options, new Ixi-related items and dedicated Poetry and Art galleries. Plus, the Ixi can receive free training today at The Swashbuckling Academy (under level 40 only). Tuskaninny Day is celebrated with a New Features post introducing two new colour options, new Tuskaninny-related items and dedicated Poetry and Art galleries. Plus, the Tuskaninny can receive free training today at The Swashbuckling Academy (under level 40 only). Kiko is celebrated with a New Features post introducing two new colour options, new Kiko-related items and dedicated Poetry and Art galleries. Plus, the Kiko can receive free training today at The Swashbuckling Academy (under level 40 only). As a Limited Edition pet, the Kiko is not permanently available for creation at the Create-A-Pet page. LE pets are typically released for creation - in large but limited numbers - on their pet days. The Draik and Krawk are Restricted and the Tonu, Chomby, Lutari, Cybunny, Hissi, Koi, Ruki, Poogle and Jetsam are Limited Edition. The NC Mall's Birthday is celebrated with a mention in the New Features and a variety of Neocash-related bonuses such as free Goodie Bags, sales and birthday-themed activities. Peophin Day is celebrated with a New Features post introducing two new colour options, new Peophin-related items and dedicated Poetry and Art galleries. Plus, the Peophin can receive free training today at The Swashbuckling Academy (under level 40 only). Ruki Day is celebrated with a New Features post introducing two new colour options, new Ruki-related items and dedicated Poetry and Art galleries. Plus, the Ruki can receive free training today at The Swashbuckling Academy (under level 40 only). As a Limited Edition pet, the Ruki is not permanently available for creation at the Create-A-Pet page. LE pets are typically released for creation - in large but limited numbers - on their pet days. The Draik and Krawk are Restricted and the Tonu, Chomby, Lutari, Cybunny, Hissi, Koi, Kiko, Ruki, Poogle and Jetsam are Limited Edition. The Discovery of Meridell is celebrated with a New Features post introducing new Meridell-related items and dedicated Poetry and Art galleries. It also often releases the Royal colour for one species of Neopet (boy and girl). The Discovery of Brightvale is celebrated just twelve days later. The 'Blumaroo - Chef Bonju' avatar can only be obtained during the month of August. To receive it you must be using the 'Mad About Orange' avatar while mixing the items 'Orange Juice', 'Gourmet Cooking for your Pet' and 'Blumaroo Steak' at the Mystery Island Cooking Pot. Blumaroo Day is celebrated with a New Features post introducing two new colour options, new Blumaroo-related items and dedicated Poetry and Art galleries. Plus, the Blumaroo can receive free training today at The Swashbuckling Academy (under level 40 only). The Discovery of Brightvale is celebrated with a New Features post introducing new Brightvale-related items and dedicated Poetry and Art galleries. It also often releases the Royal colour for one species of Neopet (boy and girl). Additionally, the odds of winning the 'Brightvale' avatar from the Wheel of Knowledge are slightly better on this day. The Discovery of Meridell is celebrated just twelve days earlier. Meerca Day is celebrated with a New Features post introducing two new colour options, new Meerca-related items and dedicated Poetry and Art galleries. Plus, the Meerca can receive free training today at The Swashbuckling Academy (under level 40 only). Usukicon is celebrated with a New Features post introducing new Usuki-related items and dedicated Poetry and Art galleries. Grundo Day is celebrated with a New Features post introducing two new colour options, new Grundo-related items and dedicated Poetry and Art galleries. Plus, the Grundo can receive free training today at The Swashbuckling Academy (under level 40 only). Though not available in Create-A-Pet, Grundos can be created at any time at the Space Adoption Agency. Mutant Day is celebrated with a New Features post introducing new Mutant-related items and dedicated Poetry and Art galleries. It also often releases the Mutant colour for one species of Neopet. In Y12, Dr. Sloth took control of the New Features to ensure that year's Mutant Day was sufficiently grotesque. Dr. Sloth has also been known to take over the news on his own day. Kyrii is celebrated with a New Features post introducing two new colour options, new Kyrii-related items and dedicated Poetry and Art galleries. Plus, the Kyrii can receive free training today at The Swashbuckling Academy (under level 40 only). Draik Day is celebrated with a New Features post introducing two new colour options, new Draik-related items and dedicated Poetry and Art galleries. Plus, the Draik can receive free training today at The Swashbuckling Academy (under level 40 only). A limited number of Draiks were released for creation when they were first introduced in Y4 (2002) but since then they have only been obtainable by other methods, such as hatching a Draik Egg or using Morphing or Transmogrification potions. They do not become available for creation on Draik Day. On this day in Y11 (2009) the Draiks began releasing in the Create-a-Pet page but quickly stopped. The Neopets Team later stated in Editorial 409 that it was an accident. Draiks created during the release are sometimes known as 9/9/9 Draiks. The Krawk is Restricted and the Tonu, Chomby, Lutari, Cybunny, Hissi, Koi, Kiko, Ruki, Poogle and Jetsam are Limited Edition. Techo Day is celebrated with a New Features post introducing two new colour options, new Techo-related items and dedicated Poetry and Art galleries. Plus, the Techo can receive free training today at The Swashbuckling Academy (under level 40 only). The Annual Chocolate Ball is an exclusive, high-toned occasion hosted by the Chocolate Factory. There is no actual player participation. The day is celebrated with a New Features post introducing new chocolate-related items and dedicated Poetry and Art galleries. It also often releases the Chocolate colour for either one or two species of Neopet. Typically, the Faerie Festival is celebrated with a New Features post introducing new Faerie-related items and dedicated Poetry and Art galleries. Plus, if players visit the Healing Springs their Neopets are guaranteed to be healed to full hit points and cured of any illnesses. However, the festival was enhanced to a small-scale event in Y11 (2009), involving participation in minor challenges for daily item prizes. The following year's festival appeared to be in the same vein until three days in when all the Faeries were turned to stone and The Faeries' Ruin plot commenced. Since then, the festival has returned to its original low-key format. International Talk Like A Pirate Day (TLAPD) is a parodic holiday invented in 1995. The Neopets Team mark the day by applying a filter to the Neoboards that causes many common words to be 'corrected' to pirate slang upon being posted. For example, you becomes ye and yes becomes aye. To add to the confusion, players can only see the effect the 'pirate filter' has on everyone else's posts; their own posts appear perfectly normal. An in-depth guide to ITLAPD. Poogle Day is celebrated with a New Features post introducing two new colour options, new Poogle-related items and dedicated Poetry and Art galleries. Plus, the Poogle can receive free training today at The Swashbuckling Academy (under level 40 only). As a Limited Edition pet, the Poogle is not permanently available for creation at the Create-A-Pet page. LE pets are typically released for creation - in large but limited numbers - on their pet days. The Draik and Krawk are Restricted and the Tonu, Chomby, Lutari, Cybunny, Hissi, Koi, Kiko, Ruki and Jetsam are Limited Edition. The Annual Gormball Championships is celebrated with a New Features post introducing new Gormball-related items and dedicated Poetry and Art galleries. Plus, the Neopedia article is updated to show who won this year's championships. In Y15 (2013) the colour Water was released for the Lenny on this day. It remains to be seen whether this will be repeated in coming years. Skeith Day is celebrated with a New Features post introducing two new colour options, new Skeith-related items and dedicated Poetry and Art galleries. Plus, the Skeith can receive free training today at The Swashbuckling Academy (under level 40 only). The Haunted Faire is a seasonal map only accessible during October. It acts as a hub for all the Halloween-related activities, such as the Apple Bobbing daily, the Haunted Hijinks Neocash event and the hunt for Trick-or-Treat Bags. In Y15 (2013) the Faire included the new 'Spooky Food Eating Contest', which turned into a small-scale plot when the winning contestant transformed into a toothy blue monster. Also, there were no Trick-or-Treat Bags that year because TNT didn't realise people would mind so much. The Haunted Faire did not take place in Y16 (2014), possibly due to the workload involved in the transition to JumpStart and the many bugs after the downtime, but Trick-or-Treat Bags did happen as promised. The Halloween entry covers the activities available on the 31st. Grarrl Day is celebrated with a New Features post introducing two new colour options, new Grarrl-related items and dedicated Poetry and Art galleries. Plus, the Grarrl can receive free training today at The Swashbuckling Academy (under level 40 only). Eyrie Day is celebrated with a New Features post introducing two new colour options, new Eyrie-related items and dedicated Poetry and Art galleries. Plus, the Eyrie can receive free training today at The Swashbuckling Academy (under level 40 only). Bori Day is celebrated with a New Features post introducing two new colour options, new Bori-related items and dedicated Poetry and Art galleries. Plus, the Bori can receive free training today at The Swashbuckling Academy (under level 40 only). Jetsam is celebrated with a New Features post introducing two new colour options, new Jetsam-related items and dedicated Poetry and Art galleries. Plus, the Jetsam can receive free training today at The Swashbuckling Academy (under level 40 only). As a Limited Edition pet, the Jetsam is not permanently available for creation at the Create-A-Pet page. LE pets are typically released for creation - in large but limited numbers - on their pet days. The Draik and Krawk are Restricted and the Tonu, Chomby, Lutari, Cybunny, Hissi, Koi, Kiko, Ruki and Poogle are Limited Edition. Symol Day is celebrated with a New Features post introducing new Symol-related items and dedicated Poetry and Art galleries. It also often releases new colour options for the Symol. Korbat Day is celebrated with a New Features post introducing two new colour options, new Korbat-related items and dedicated Poetry and Art galleries. Plus, the Korbat can receive free training today at The Swashbuckling Academy (under level 40 only). Halloween is celebrated with a New Features post introducing new Halloween-related items and dedicated Poetry and Art galleries. It also often releases the colour Halloween for one species of Neopet. During the 31st, Deadly Dice can be played at any time of the day and Edna can be challenged in the Battledome at any time of the day. The Haunted Woods site theme (a.k.a. the Halloween site theme) can be obtained today by refreshing a page during the minute before midnight Neopian Standard Time; i.e. between 11:59:00pm and 11:59:59pm NST. The theme is granted through a 'Something Has Happened' event. It isn't necessary to refresh on the Haunted Woods pages; anywhere on the site will work. The Haunted Faire entry covers the month-long Halloween activities. The Games Master Challenge is a week-long gaming event hosted by AAA. Players choose one of two teams (Brains vs Brawn in Y13, Pirates vs Ninja in Y14 and Sun vs Moon in Y15) before being posed multiple clue-based challenges each day, the completion of which earns their team points. The challenges vary from achieving a certain score in a certain game, to favouriting or rating certain games or to achieving a total number of games played. Additionally Lulu (or Reslen as in Y15) runs an optional Neocash element. Completing each day's challenges can earn the player both new and old items. At the end of the event the player may receive additional items and a trophy (prizes vary depending on how much was completed). AAA also appears in the Daily Dare. Slorg Day is celebrated with a New Features post introducing new Slorg-related items and dedicated Poetry and Art galleries. It also often releases new colour options for the Slorg. Pteri Day is celebrated with a New Features post introducing two new colour options, new Pteri-related items and dedicated Poetry and Art galleries. Plus, the Pteri can receive free training today at The Swashbuckling Academy (under level 40 only). Vandagyre Day is celebrated with a New Features post introducing two new colour options, new Vandagyre-related items and dedicated Poetry and Art galleries. Plus, the Vandagyre can receive free training today at The Swashbuckling Academy (under level 40 only). Neopets will be turning 16 this year. Neopets' Birthday is celebrated with a New Features post introducing new birthday-related items and dedicated Poetry and Art galleries. It also often releases a colour for either one or two species of Neopet. Free training for ALL species is available at The Swashbuckling Academy today (under level 40 only). Brain Tree rewards are increased by 25% today. A greater number of tickets are available at the Concert Hall Ticket Booth today. From the 15th through to the 19th (five days) game scores can be sent five times rather than three. Treasure of the Black Pawkeet is free today, plus it costs only 150np (rather than 300np) for the whole of November. The 'Happy Birthday!' avatar can be obtained today by viewing the New Features. Usul Day is celebrated with a New Features post introducing two new colour options, new Usul-related items and dedicated Poetry and Art galleries. Plus, the Usul can receive free training today at The Swashbuckling Academy (under level 40 only). Xweetok Day is celebrated with a New Features post introducing two new colour options, new Xweetok-related items and dedicated Poetry and Art galleries. Plus, the Xweetok can receive free training today at The Swashbuckling Academy (under level 40 only). The Advent Calendar is a December-only daily. Players can visit every day to view a short animation and receive two to three new items and a few Neopoints. In Y14 (2012) and Y15 (2013) an image of a snowflake or nova, respectively, was hidden in each day's animation. Finding and clicking the snowflake/nova earned the player an additional item. The 'Winter Holiday' site theme can be obtained by participating in the Advent Calendar to some extent, although the exact requirements are unknown. The 'Plastic Fir' avatar can be obtained by visiting the Advent Calendar on December 1st. The 'Seasonal Attack Pea' avatar can be obtained by visiting the Advent Calendar on a random day that changes every year. The Gift of Neocash is a Neocash promotion that runs from November 28th to January 4th. If a player spends a certain amount of NC during this time they will receive bonus NC after the end of the event. The bonus increases with the amount spent; for example if between 500-999 NC is spent the bonus will be 100 NC, while if between 1,000-2,499 NC is spent the bonus will be 175, and so on. The Snowager hibernates during December, which means you can steal its treasure without risk of it waking and blasting you with snow and ice. This also means it is impossible to win the 'Snowager - Rawr!' avatar this month. Bruce Day is celebrated with a New Features post introducing two new colour options, new Bruce-related items and dedicated Poetry and Art galleries. Plus, the Bruce can receive free training today at The Swashbuckling Academy (under level 40 only). The Stocking Stufftacular is a Neocash activity that runs from December 8th to January 1st. Players can purchase stockings and hang them before midnight NST to receive an item the following day. Each day's item is not known in advance. Wocky Day is celebrated with a New Features post introducing two new colour options, new Wocky-related items and dedicated Poetry and Art galleries. Plus, the Wocky can receive free training today at The Swashbuckling Academy (under level 40 only). The Holiday Dream Neopet Giveaway offers the chance for players to enter one of their existing Neopets for transformation into their dream colour and species combination. Ten winners are selected randomly from all entrants and are announced on December 25th. Borovan Day falls on the birthday of Adam, one of the original creators of Neopets. Within the Neopian universe Borovan is a fictitious beverage, possibly made from hot chocolate and asparagus. The day is celebrated with a New Features post introducing new Borovan-related items and dedicated Poetry and Art galleries. The Day of Giving is celebrated with a New Features post introducing new Christmas-related items and dedicated Poetry and Art galleries. It also often releases the colour Christmas for one species of Neopet. Additionally, the ten winners of the Holiday Dream Neopet Giveaway are announced on this day. Ogrin Day is celebrated with a New Features post introducing two new colour options, new Ogrin-related items and dedicated Poetry and Art galleries. Plus, the Ogrin can receive free training today at The Swashbuckling Academy (under level 40 only). Although there isn't a specific New Features post dedicated to celebrating New Year's Day, items and other new things relating to the new year are typically introduced within the first week of January. Neopia will be entering Year 18. On your birthday you will automatically see the 'Birthday' site theme for the day (this theme cannot be permanently obtained) which comes with the bonus of no adverts, and you may experience an increased frequency of Random Events. The betting in the game Food Club is restricted by a maximum bet of 50 + (2 x y) neopoints, where y is how many days old your account is. Both your maximum bet and your account's age in days are shown on the Place A Bet page, so you don't actually have to do the math. At 1+ week you can view the Hidden Tower. At 4+ months you can purchase items from the Hidden Tower. Every item in Neopia has a rarity assigned to it that governs how often it restocks in the shops. When your account is first created you will be unable to see items of high rarity when they do restock. At 3+ days you can now have your game scores counted in the High-Score Tables. At 4+ days you can now visit the Advent Calendar for the daily prizes, if it's December. At 1+ week you can now cast your votes in the Beauty Contest. Stats: Level 3 or higher. Species: Chomby, Cybunny, Draik, Hissi, Jetsam, Kiko, Koi, Krawk, Lutari, Poogle, Tonu. Colours: Alien, Baby, Biscuit, Camouflage, Chocolate, Christmas, Clay, Cloud, Coconut, Custard, Darigan, Desert, Disco, Electric, Faerie, Fire, Garlic, Ghost, Gold, Grey, Halloween, Ice, Island, Jelly, Magma, Mallow, Maraquan, Mutant, Pirate, Plushie, Quiguki, Rainbow, Relic, Robot, Royal, Sketch, Snot, Snow, Sponge, Spotted, Strawberry, Starry, Striped, Tyrannian, Usuki, Zombie and any Fruit or Vegetable colour. There are never restrictions on the species you can create through Create-A-Pet, however. If one of those listed should become available for creation then users of any account age would be able to do so. Everyone starts out with space for 12 games in their Favourites. As your account ages you will find you can keep more games there. The following chart is in months. Everyone starts out with space for 100 messages in their neomail inboxes. If you reach the limit without deleting any old messages then other users will be unable to send you new messages. As your account ages you will find your inbox grows somewhat. The following chart is in months. Everyone starts out with the ability to transfer a pet in and out once per month. As your account ages you will find you can make more transfers per month. You can view what transfers you have made during the current month at the Transfer Status page. The following chart is in months. At 24 months (two years) there is a small chance that a book will fail to disappear in the usual puff of smoke when you read it to a Neopet, making it reuseable just that once. Reaching 24 months (two years) earns you a number of additional 'interests' to choose from when customising your userlookup. Thirty-six months (three years) grants you access to the Almost Abandoned Attic, a shop that functions in much the same way as the Igloo Garage Sale; i.e. it restocks a wide variety of items and there are limits on the number of purchases you may make. Everyone starts with the ability to have 10 lots at the Trading Post at one time. Once you account has reached 36 months (three years) you can have up to 15. Everyone has 217 'default' NeoTitles to choose from on their Neoboard Preferences page, but there are 32 more that only come with age. The Elite Boutique is an exclusive section of the NC Mall, available once your account has reached 49 months (four years). It is accessed via the NC Mall, through the image of a red circle with a yellow star. Reaching 60 months (five years) gains you the opportunity to get 3% off the prices at the Hidden Tower. This discount is only available on the 3rd Wednesday of every month, the dates for which can be found here.